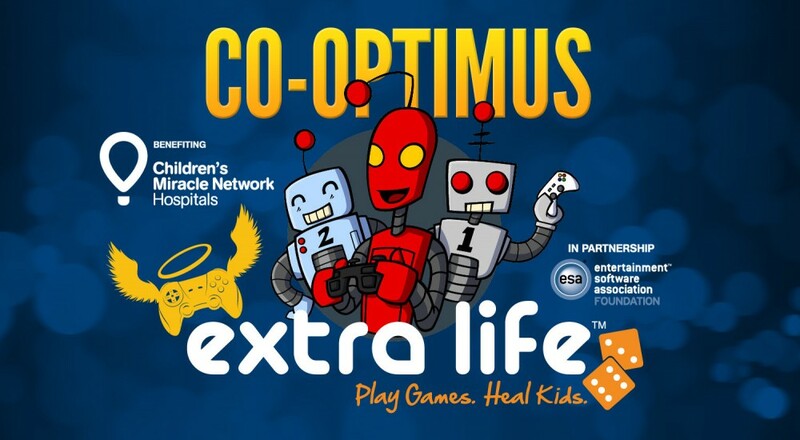 Co-Optimus staff and community members are teaming up, once again, to raise money for Children's Miracle Network Hospitals by participating in Extra Life. Last year our team raised a total of $2,163.75, and our goal for this year is $2,500. Help us reach that goal by joining our team or donating. Extra Life is a full-day gaming marathon that takes place every fall, which raises money for Childrens' Miracle Network Hospitals all over the US and a handful of other countries. Last year, the event raised $2.3 Million, and it all went to help kids with serious illnesses like cancer or leukemia. This year's marathon is scheduled for November 2nd, which is also the weekend we set our clocks back an hour due to daylight savings time. That means we have an extra hour for Extra Life, making it a 25 hour gaming marathon. That's a lot of gaming for a great cause! Here's how it works: First, you need to sign up by heading to our team page and clicking "Join This Team!" If you don't want to join our team, go straight to Extra Life instead. During the sign-up process, you'll be asked to pick a hospital. You can pick any children's hospital that is part of CMN, it doesn't have to be your local hospital. Once you're done signing up, personalize your fundraising page and send it to your friends and family. All donations you acquire go straight to the hospital you choose. Then, on November 2nd, play games for 25 hours. It's that simple. You get to play games for 25 hours straight, kids get the money they need to get healthy, it's a win-win. If November 2nd doesn't work out for you, there are many other options. You could find two buddies and split the 25 hours into three shifts. Or you could play as long as you want on November 2nd, and make up the rest of the time during the following week or weekend. In the end, the gaming is not that important, it's the fundraising that matters. But hey, we know you wouldn't mind 25 hours of guilt-free gaming. Of course, if you're not interested in participating but still want to donate, you can do that too. Head over to our team page, pick your favorite team member from the roster at the bottom of the page, click on their name, and then click "Support Me" on their page. In addition to our Extra-Life team page, we also have a team page here at Co-Optimus. You'll find more info there, including our fundraising progress, links to our live streams (yes, we're streaming the whole marathon), and a rough schedule of our gaming plans. Even if you're not participating, you're welcome to game with us on November 2nd. We urge you to participate in any way you can, but donations are what these kids really need, so please consider donating. Page created in 0.7404 seconds.